A clear black star-studded night lay just beyond Luchiano’s porch railing. I settled back in my chair comfortably at ease. "To the Damn Yankee." Kevin said raising his glass of cabernet. "To the Damn Yankee," we echoed raising our own. "To the captains," I said feeling absolutely grand. Tonight was our first night in the Bahamas. We washed up well I thought noting four identical selections of white tees tucked into khaki. Jim kept his promise. Diner alfresco, "on the rail" above Count Basie Square at Port Lucaya Marketplace, Luchiano's Restaurant was the perfect choice. I lifted my glass and drank to the captain. "To the crew," Jim responded. "To Teresa and Gwen," he added with a laugh tapping his glass against Teresa's and then mine. Teresa grinned at Jim before sipping. I shot him a pointed stare he didn't notice. I am now relegated to crew. I gulped my cabernet. So be it. I'd bite my tongue. Tonight we were celebrating. A clear black star-studded night lay just beyond Luchiano's porch railing. I settled back in my chair comfortably at ease. How unlikely it seemed that last night I had stared into a sky blotched with oppressive low-lying clouds spitting drizzle while struggling to hold my seat against the turbulence of a confused and angry sea. Tonight the air hung soft and balmy. I shook my head. It was barely believable. I gazed out over the docks that fronted the harbor where numerous yachts of sail and motor lay at rest. Twenty-four hours ago tense and tight-lipped we fought a howling wind that whipped the waves into a swollen tumble of breakers to maintain the Damn Yankee's course. I shivered as a slight breeze lifted the edge of the white linen tablecloth. When Jim reached to top off my wine the lyric of an ancient sea song floated into my mind. Slowly its words formed. The thought followed. All our dangers are drowned in wine. I smiled to myself as I sipped. An appropriate sentiment in the twenty-first century as in the eighteenth when it was penned, I wished the words had come to me earlier. We could appreciate the words. They would have made a fitting toast for acknowledging a similar experience. Too late now though, dinner arrived. And we were all hungry. Two empty bottles of Sterling and two desserts more than we needed left us stifling yawns. But we were all unwilling to call it a night. Sleep could wait another hour or two. I nodded to the waiter. He filled my coffee cup a second time. Another jolt of caffeine should do the trick. The Marketplace below was filled with people, sound and music. I wanted to join them. I wanted to become a part of it. I had never seen anything like the Marketplace at Port Lucaya. Nor could I have imagined colors vibrant enough to rival the work of a Disney animator coating the wood framed buildings encircling the square. 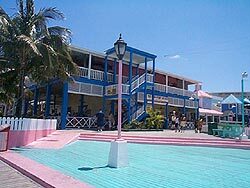 Shades of blue to turquoise, green to lime, yellow to saffron all vied with the bright pink extending from the concrete of the dance floor over the boardwalk forming a promenade bordering the perimeter of Port Lucaya Marina and Yacht Club. Rather than clashing both form and color worked. The lacy gazebo bandstand holding pride of place in the Market created a scene reminiscent of the Garland and Rooney musicals of the forties and everyone wants to be in the show. Young and old, men and woman, teens to toddlers I saw a group of ageless participants. 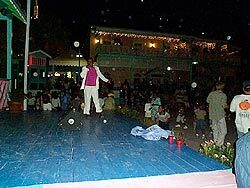 Tourists bopped and jounced to the beat in a frenzy of movement while with the subtle bend of knee and a facile sway of hips the Bahamians moved to the music with an easy authority. I stared captivated by the fluidity of their moves. Two children dashed by screeching with pleasure. Teresa and I laughed out loud. The setting apart, it was the energy and excited exuberance of the crowd that set us swaying at the edge of the square while the strains of raggae and socca swirled around us. I already loved Port Lucaya. And it only got better. We snagged an empty table. All the better to watch the activities and absorb the scene while Jim and Kevin were dispatched for drinks. "I can't believe we're really here," Teresa said. "Is it like you expected?" I pulled my gaze from the carnival around me. "Yes," I hesitated, "and no. This is beyond anything I imagined." I struggled for the words. "There's a joyous intimacy to it all, adults and kids together dancing," I shook my head, "I hadn't expected that." Teresa nodded. We smiled in acquiescence. "Drinks all around, ladies," Jim said setting down four wines in plastic cups. "Kevin's buying but one drink is all I can force down after that dinner." "Timing is everything," Kevin laughs lifting his cup. We settled back to drink our wine enjoying the music and the scene. Dazzled, I continued to gawk. Less than two weeks before Christmas, strings of lights twinkled overhead festooning a decorated tree that reached beyond the second story of the surrounding buildings. Gaily- wrapped packages of all sizes sat beneath the tree on mounds of artificial snow. More tiny lights covered the structure open on three sides that housed Santa's workshop. Elves worked in busy animation a few feet away from greenery and blooming flowers. We could have been sitting within a movie set speaking our lines. I blinked in amazement expecting someone to yell, "Cut! Get those people off the set." I glanced around. No one did. The lights continued to glitter. Unbelievable, I thought, still staring while the music pounded and everyone danced. The yawns won out. We finished our drinks then we succumbed to fatigue. The v-berth never felt that good. I could hardly wait for tomorrow. Surprised that Jim slept past nine the next morning, we hurried to catch the marina's ferry to join Captain Kevin and Teresa. We were running late. Kevin and Teresa would be waiting unless they had overslept too. The ride across the harbor took mere minutes. Jim and I stepped off the ferry at the Pelican Bay Hotel to see Kevin above, waving from their room's balcony. He lifted two fingers and disappeared through the sliding doors. Jim glanced at his watch, looked at me and shrugged. Our turn to wait. I laughed. Time didn't matter. The day stretched ahead. The sun was shining. We had no miles to make. There was no itinerary. We spent the remainder of the morning wandering through shops offering everything from the glitter of rainbow colored stones set in gold to iridescent primary colors splashed across the white of cotton tee shirts. I managed to resist the lure. After all, Jim and I were in this for the duration. 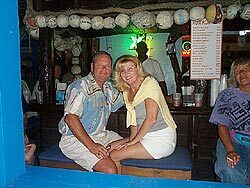 Jim's words, "We are not on vacation," flashed into my mind and remained. Yet, vacation style activities filled our first four days at Port Lucaya. Kevin and Teresa were, after all, on vacation. I was happy to join them. Jim obliged us all. Soaking up the warm Bahamian sun, we lounged until the heat sent us into the pool for a cooling dip then up to the pool bar for an equally cooling sip. "I could get used to this, Jim," I said after swallowing the last of my beer. "We'll have to pace ourselves," Jim replied finishing his own beer before pushing his stool away from the bar with his foot. I was about to order another. Instead, I swung around on my own stool and slid off. Then I caught Jim's cagey grin. "Two more Kaliks?" Noreen, the bartender at the marina pool bar asked with a smile and a swish of her long ponytail. "Four more," Kevin put in. "Our celebration continues. We've sailed to the Bahamas and it's your turn to buy, brother." Jim laughed. "That's a decision I can live with." He fished for his wallet and bellied up to the bar. Noreen set four ice-cold beers in front of us. I reclaimed my stool and reached for the nearest bottle. Yes indeed, I could get used to this. We hit the vital points. 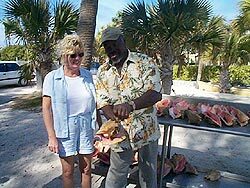 Marina bar, hotel bar, several bars at the Marketplace and Billy Joe's bar on the beach at Our Lucayan Hotel where I discovered conch. Not the shell, mind you, but the shell's inhabitant. Who knew? Cracked, scorched, grilled or tossed in a zesty salad, I was hooked. Jim on the other hand, stuck to hot dogs. 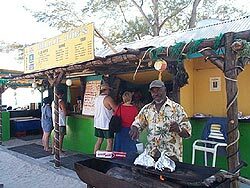 We all developed a quick appreciation for "Kalik" the local Bahamian brew. The offer of two for $5.00 in the Marketplace made it easy as well as cost efficient to order the second and then the third and fourth. Too soon, Captain Kevin and Teresa headed stateside promising his and Theresa's availability for the crossing next year. I was already looking forward it. Kevin's week ago prediction won out. They both left with tans. Whether the twists and turns of fate or careful planning put us here, I did not care. I was quickly settling in. The boat needed a thorough wash down. That was my job so bucket and sponge in hand I quickly immersed myself in water and suds. I enjoyed it. The Damn Yankee had weathered the crossing with her usual aplomb. She deserved a bit of pampering. I'd even polished the stanchions. Three hours later, the Damn Yankee shone from bow to stern and I was setting out seat cushions and pillows ready for guests. "Ahoy, Damn Yankee; Tack Sea here." I lifted my head to see a dinghy approaching. I opened my mouth to answer. "Hey there, Tack Sea," Jim answered lunging through the companionway into the cockpit. "Good to see you," he said dropping the stern ladder and grabbing the dinghy line. "We're Larry and Sandy Foster come to invite you for cocktails. Thought it was time we met. 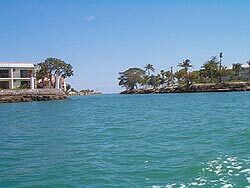 We're anchored two lagoons up from here." Jim and I answered in unison without consulting. There was no need. We had no immediate plans. We had nothing pressing, no prior commitments. Actually, we had no schedule at all. The realization stunned for a moment. "How's five o'clock?" Larry suggested. "Fine," Jim answered. "We'll see you then. And thanks." "What can I bring?" I asked. "No need. Sandy and I've got it covered." "We'll bring some wine," I called. We were ready way before five. Jim gave our dinghy her head as we zoomed through the canals to where Tack-Sea, Larry and Sandy's 40 foot C&C's white hull lay. Two other sailboats joined the Tack-Sea in quiet seclusion. "Welcome aboard Gwen," Larry said grabbing my hand to haul me up over the transom's lifelines from the swim ladder. When I stepped down into Tack-Sea's large cockpit and released Larry's steadying hand, I relished that wink in my stomach signaling "boarding relief." Now, I could relax. I had maintained my footing once again. I hadn't tumbled overboard, yet. More than a semblance of agility is needed in boating. I quickly realized climbing ability is an added plus. The challenge of stepping on or off any boat demanded either clambering up or jumping down. Docks, neither fixed or floating, were ever set flush with boat decks. In addition, tidal changes raised then dropped vessels with predictable precision. Agility is not one of my strengths. I quit ballet at five. Mastering the split proved an insurmountable obstacle. Had I only known? Now, I realize I should have stuck it out. Dinghies guaranteed unpredictable wobbles and jerks. Bracing my legs for the movement, I'd flail an arm like a tightrope walker destined to remain forever in the ranks of the remedial. The continuation of my ballet training would have at least lent me a certain grace. So be it. Ballet or boating, my legs were never long enough. My feet were never sure enough. My arms were never strong enough. Too late, I understood the newest fad of wall climbing would have been an easily transferable skill for living aboard a boat. Jim, on the other hand, pulled himself over the lifelines with "one hand for the boat" and his other holding two bottles of wine in a net bag "for himself." How did he do that? I squeezed into the inches of space between two men whose half-filled glasses had me wondering if Jim and I were late. We weren't. They had just started earlier and brought their wine with them. Jim passed our contribution to Sandy who smiled a welcome and did the introductions. In minutes, Jim and I were sitting with full glasses, nibbling on cheese and crackers as we listened to the conversation begun before our arrival. Larry and the men were deep into a discussion of their plans to spend the winter months anchored in Georgetown. The weather was not cooperating. Strong northerlies were keeping them impatiently anchored. And they were fearful their favorite spots would be taken. "I don't see a window opening much before the middle of next week," Larry said. "Damn," said Dave, the bearded man to my right. "I'd planned to be settled on the hook by Christmas." "We could still be sitting in Lake Worth," said his wife. "True enough," Dave nodded, "no choice but to wait it out," he said with a shrug. "Are you and Gwen joining us, Jim?" Larry asked. "You're welcome to come along." The others joined in voicing the invitation. "Come on," they urged. "You'll love it…" they insisted. I searched Jim's face. I knew he hoped to travel the islands in tandem with other boats. Would he consider leaving with them next week? Did we want to head out so soon after the crossing? Jim shook his head. "No, but thanks. We're staying put for a few months." Surprisingly, for a few seconds I was disappointed. "We'll head out in March, shoot for the Abacoes," Jim continued. "Hopefully, the weather will be more settled by then." "I wouldn't mind a few months here, Larry." Sandy announced with a grin. 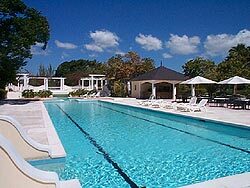 "Heated pool, hot showers, washing machines…"
The women sighed with the pleasure of it all. But their husbands would hear none of it. They were bound for Georgetown. The winds would subside soon, wouldn't they? They were far more experienced than Jim and I. They would surely know. I shifted in my seat feeling just a tad guilty for remaining behind. "Gwen, I envy you. We're not going to have a very comfortable run if these winds continue," Sandy said. "It would be fun to spend a bit more time here but we've got people flying into Georgetown for the holidays. I just hope we're able to get out of here by next week." "I wondered if we'd get out of Lake Worth," interjected a woman named Jane. "And we're here now…" She looked at her husband. I recognized the suggestion in her eyes. "Oh no," he interrupted, "we've got to reach Georgetown by Christmas. We always spend the holidays in Georgetown." Not knowing quite what to say; I mumbled something about being sure the wind was bound to change soon. How inane, I thought. My knowledge of weather thus far was confined to the difference between sunshine and rain. I thought apparent wind was a light breeze while real wind carried a hurricane force blow. But, I was learning. I listened as the conversation swirled around me. They had specific plans for their winter. Talk of volleyball games on the beaches and pot-luck suppers under the stars left me envious for the experiences. These three couples obviously had a history of places and events spent together. I trusted Jim and I would soon have our own. "So Gwen, what did you think of your first crossing?" "The crossing?" I repeated as I gathered my thoughts. Daydreaming of islands yet to see, I'd lost the thread of the conversation. I'd obviously missed their assessment of our voyage across the Gulf Stream. What did I think? I had no idea. I had no frame of reference. Was the weather we'd experienced normal? I had heard the stories of the Gulf Stream's unpredictability. I could recognize the hesitation in the faceless voices over the VHF as they appraised weather predictions and weighed options. I discovered that even with the decision made and the anchor weighed the question still loomed to be answered hours later on the water. I could now attest that the Gulf Stream's renown for unpredictability was predictable. The women waited. How to put the experience into words? It was the emotion I could summon at will. My heart-stopping fear at each lurch, the breath-holding rolls, my shudder at each crack of the reefed mainsail, ignoring the slide of cold sweat down my back through the continual scream of wind in my ears while spray from the breaking waves soaked the air and my face. Fighting against the rage of noise and violent velocity, could I hold myself together? Wishing to be anywhere but where I was, knowing there were long hours yet to get through. Whose dream was this? On some level, it was mine. My years of reading offered a meager preparation. I just hadn't expected the confrontation so soon. Not wanting to sound like a complete novice, I searched for the right words. "Well," I ventured, "I'd say that crossing was on the severe end of uncomfortable." Sandy and Jane nearly choked on their wine. The other woman merely stared. Conversation stilled. The men on either side of me paused to look at me with curious interest. Jim merely smiled. "Severe end of uncomfortable," Jane hooted. "God, I've got to remember that!" "What's so funny?" Larry asked. "Gwen says that crossing was on the severe end of uncomfortable," Sandy answered. "Right, winds on the nose at thirty and gusting, eight to ten foot seas breaking in every direction, I'd say that's quite an understatement." "Not to mention the twenty-two hours at three knots it took us get over here…" said Jane. "I was sea sick the whole time," the third woman volunteered. "If I could, I'd stay right here." "It was the worst!" Sandy and Jane said simultaneously. Dave poured me another glass of wine. "You've got a good attitude, Gwen. You can sail with me anytime. But, it was a bear of a crossing." "I'll second that," Larry added. Basking in the laughter and approving smiles, I sipped my wine. So many miles behind us and with many more ahead, Jim and I had crossed more than the Gulf Stream. It felt amazingly good. We were still feeling our way into our new life. Charts will get you where you want to go. Once arrived, you're on your own to plot uncharted territory. New scenery offers a backdrop peopled with strangers, but not for long. Many quickly become friends. Some we will travel with. Others we will continue to meet in unexpected places. I cast a lingering look around the cockpit silently putting names to new faces and failing to remember the names of the third couple. I'd need to speak up and ask soon. Meantime, the conversation resumed around me. It was a bold choice we'd all made. But I could hear the pride in it. I eased back against the cockpit cushion and swallowed the last of my wine. Larry was already opening the bottle Jim and I brought. And cocktail hour wasn't nearly over.